Amy's Royal Treatment is always stocked with a huge assortment of quality dog food, treats and chews, dog clothes, dog care, travel gear for dogs on the go and other speciality and novelty items. We take pride in staying current with the latest trends in the dog world. 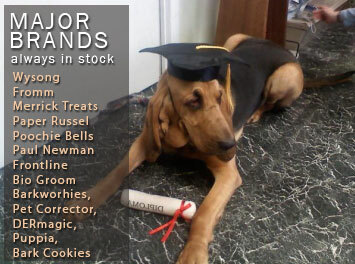 You'll find a great variety of breed-specific merchandise as well. Our selection of merchandise is constantly changing so check back often. We carry breed specific items as well as watches, wallets, notepads, cards, novelty signs, magnets and humerous door mats. We have all the latest trends in dog clothes for all sizes as well as leads, collars, harnesses and leashes.